How should the pulls get fastened on cupboard doors? If your kitchen cabinet handles get installed vertical on the doors, does it look right when the drawer pulls are horizontal? Which one is easier to grab onto? What’s the most popular way of installing them. I’ll answer these questions and address the pros and cons of both options. There’s really no wrong or right way for the decorative pull to be fastened onto the cabinet door. It’s going to resolve down to personal preference. I will tell you that the most popular direction is mounting them horizontally. My observation comes from over thirty years of being in the cabinetry industry. 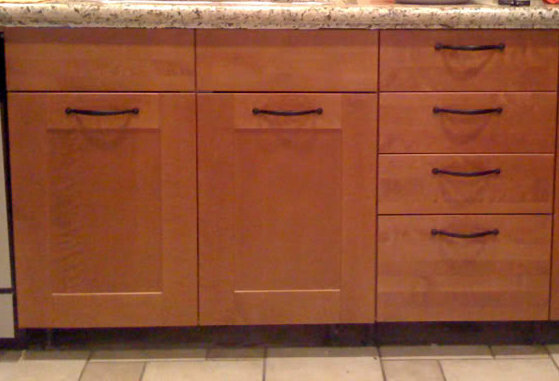 This is a standard question when we fabricate our Formica cabinets; “do you want the handles to be like this or the other way?” Without question, the popular answer is vertically. What are the disadvantages or advantages to either placement? They are easy to grab onto. It’s just naturally more comfortable for the arm and wrist movement when the kitchen or bathroom vanity pulls are secured to the doors this way. They can be installed lower on the base cabinet doors. This allows for more clearance next to the countertop edge when your cabinet doors are raised panel. Because the frame of the doors is only two and a quarter inches (2-1/4”), it makes the distance uncomfortable if installed left-to-right. It only leaves them one and one quarter inches (1-1/4”) from the countertop edge. The cupboards do not look as balanced from the designers eye. Having the pulls mounted in two separate directions, ascetically is not as pleasing to the eyes as when they are all installed horizontally. The advantages and disadvantages if mounting pulls in this direction. They are pleasing to the eyes when installed this way. Many high-end home interior decorators prefer this method because it makes things look more balanced and uniform. Especially if your cabinets are European style. The lines of a European cabinet set of bathroom vanities or a kitchen are very distinct. If all of the pulls are going in the same direction things just look nicer. Note:Most prefab cabinets have the handle locations already pre-drilled. The pulls can be mounted in the center of the doors. If all of the cupboard doors are decent sized, it’s acceptable to mount the handles in the center of the doors toward the top. 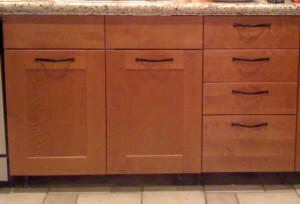 The handles are too close to the top of the countertop if installed on a five piece door. These style doors are the ones that have the picture frame look. As previously mentioned, it only allows one and a quarter inches of clearance from the top’s edge when cabinet pulls are installed horizontally. They are harder to grab onto. 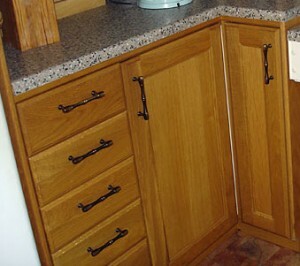 If you want your kitchen cabinets to look as balanced as possible, then install the cabinet pulls horizontally. If you are more concerned about having the most practical application for usability, then install the kitchen cabinet pulls vertically.